How Much Omega-3 per Day? Fish oil is traditionally obtained by eating fish rich in omega-3 fatty acids -- like mackerel, tuna and salmon. Those who cannot or choose not to consume fish can get fish oil through the use of supplements, however. 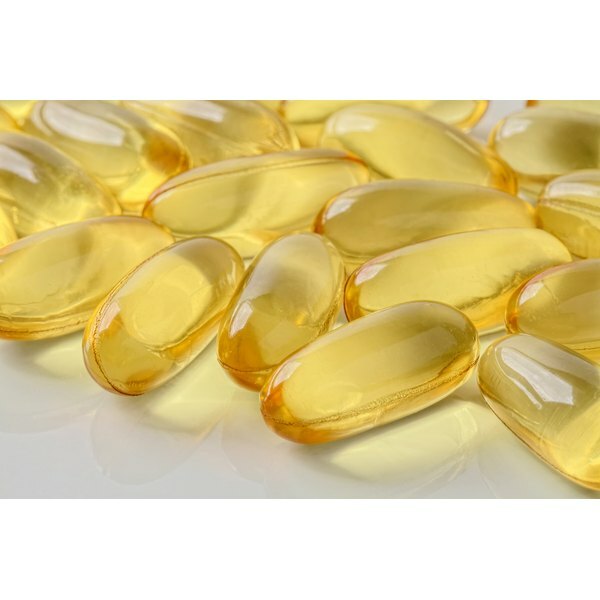 Though fish oil can be used in the treatment and management of a number of conditions, it appears to be especially effective at preventing certain cancers, lowering fat stores in the blood and slowing cognitive dysfunction. Check with your doctor before taking fish oil capsules or other supplements. Fish oil may be effective in decreasing the risk of some types of cancers. In fact, research published in 2010 in "Cancer, Epidemiology, Biomarkers and Prevention" found that women who consumed fish oil or fish oil supplements regularly were 32 percent less likely to develop breast cancer than those who did not ingest this nutrient. Fish oil may also slow the growth of cancers associated with hormone production, including those of the colon, pancreas and prostate. If you have a family history of cancer, talk to your physician before increasing your intake of fish oil. Triglycerides, a type of fat or lipid found in the bloodstream, are produced by the liver or obtained through food. Those who develop high triglyceride levels over 200 milligrams per deciliter may be at risk for the development of certain chronic health conditions, including heart disease. According to the National Institutes of Health, fish oil may be able to decrease triglyceride levels by as much as 50 percent. Be sure to consume fish oil in the proper dosages to ensure optimal results when it comes to lowering triglyceride levels. Alzheimer's disease -- a type of dementia that impedes thinking, memory and behavior -- affects as many as 5.2 million Americans, according to the Alzheimer's Association. A 2007 study published in the "Society for Clinical Nutrition" suggests that fish oil may offer some protection when it comes to Alzheimer's disease. In fact, individuals who have high blood levels of omega-3 fatty acids -- which are found in fish oil -- may exhibit larger brain volumes as they age. As brain volume increases, the likelihood of developing Alzheimer's disease and other forms of dementia appears to drop. Individuals who have been diagnosed with a chronic health condition -- or have a family history of specific chronic disorders -- should increase their intake of fish oil with caution only under the supervision of a doctor. Consuming fish oil supplements in low doses, less than 3 grams per day, is likely safe for most adults, according to MedlinePlus. Eating too much fish can be hazardous though, because some types contain mercury and other contaminants. According to the American Heart Association, healthy adults should aim for 3.5 ounces of fish twice a week for optimal health benefits. Alzheimer's Assocation: What Is Alzheimer's?